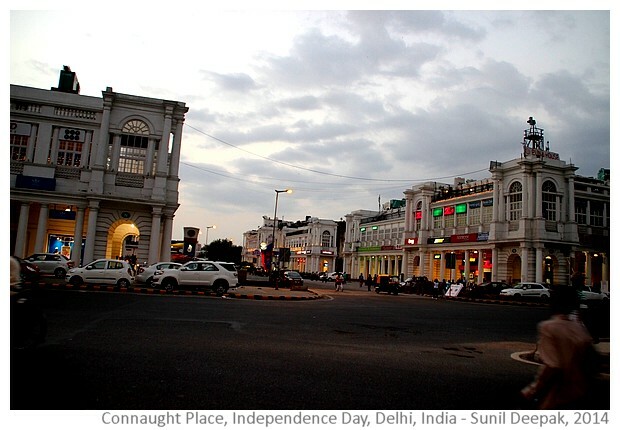 The last time I had been in India for 15th August celebrations must have been around 30 years ago. 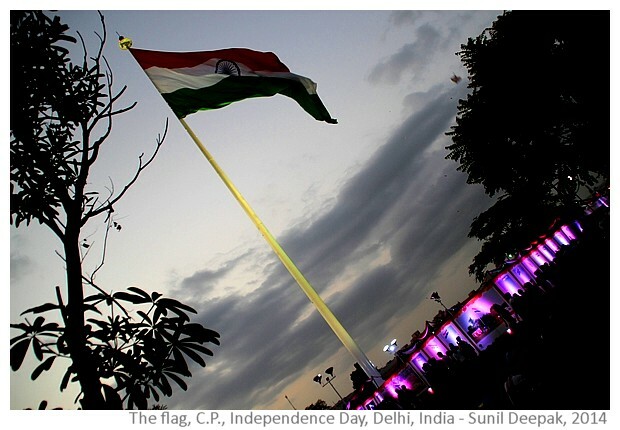 Thus, being in Delhi for this independence day was a special occasion for me. 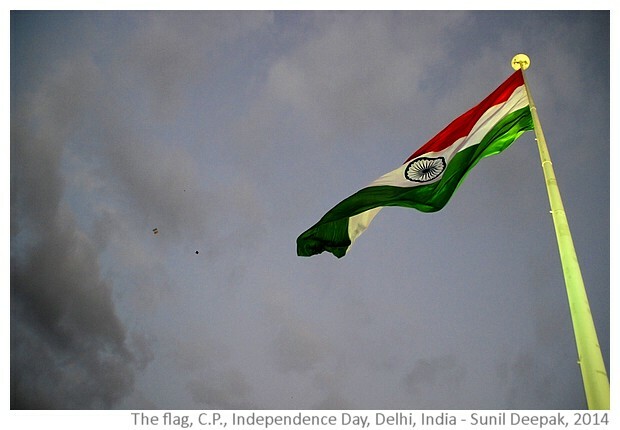 Growing up in the immediate post-independence era, I had also imbibed the values of patriotism and national pride. 60 years later, my ideas about patriotism and nationalism have changed but that is another story! I remember once going to Red Fort as a child to listen to Pandit Jawahar Lal Nehru and the long walk back home along with thousands of other persons after the speech. Though there was no TV in those days, listening to the prime minister's speech on the radio was something to which I had always looked forward to. 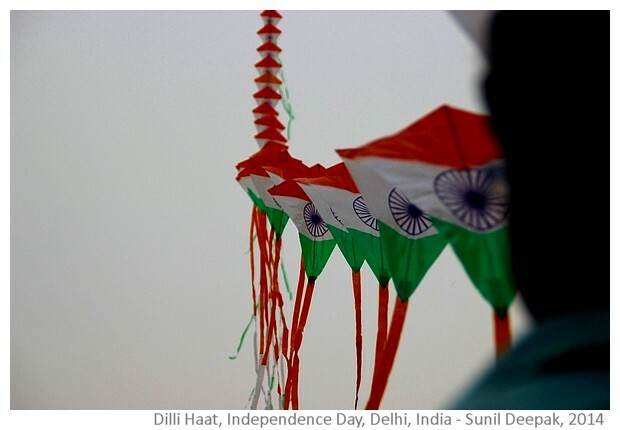 After leaving India, for a long time I had missed not being able to listen to the Independence day speech so usually I waited to ask my sister on telephone about it. Those were the pre-Internet days. Over the last decade, even though Doordarshan did not provide any internet based live transmissions, it had become easier to read about the speech on internet. Slowly a feeling of cynicism coupled with indifference had crept in. The speeches were lacklustre and afterwards it was difficult to remember anything that the prime minister had said. 15 August had become a bureaucratic boring event. This time while I waited to hear the speech of the new prime minister, I was not sure if the event merited any enthusiasm. From what I had read occasionally on internet, in my mind Mr. Narendra Modi's figure has been associated with communalism and intolerance of religious minorities. Over the last few weeks that I have been back in India, some of the things said by and campaigns launched by some BJP persons had reinforced those fears. 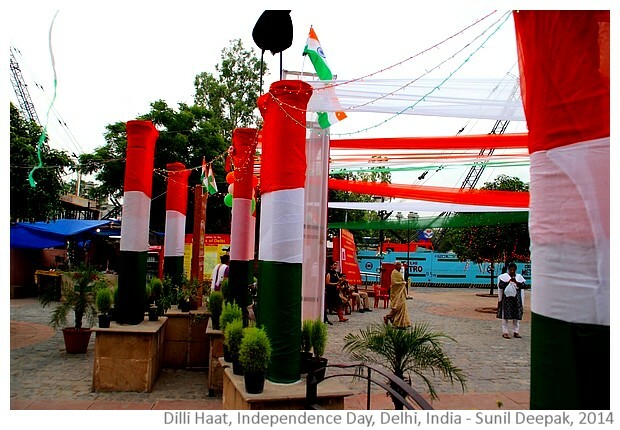 Still I had thought of going to Red Fort just to relive the old times. However, the metro services does not start early enough so I had given up the idea. Thus, I had sat in front of the TV with a bit of trepidation. However I liked Mr. Modi's speech very much and also the way he spoke. Especially his words about communal harmony, discrimination against girls and the need for toilets and cleanliness. He seemed very passionate about these issues. There were times, when listening to him brought a lump to my throat. One day later, thinking about his speech, I can see many contradictions about the issues he raised. Such as his slogan "Make in India". I know that India has to increase its industrial production but it would also mean intensifying the use of the natural resources of India and that will mean displacing people from their lands and endangering our environment. Reaching the "zero effect" he recommended is not realistic in the short or medium term, so how do we deal with it? He also talked about giving up violence because it does not resolve anything (I agree with that whole heartedly) but would he extend his non-violence exhortation to the police and state agencies that jail or fire on persons who protest against the government's policies? Even if I have my reservations about some of the things Mr. Modi had said yesterday and even if we all know that "walking the talk" is not so easy, still I am glad that I could watch and listen to him live. It was a pleasant change from the cynicism and indifference of the past decade. 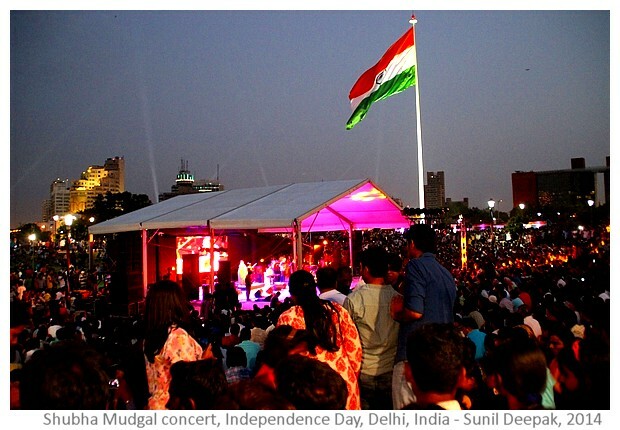 In the evening, we went to Connaught Place for the Shubha Mudgal concert. There were so many persons at the concert that we could only listen to her from a distance. 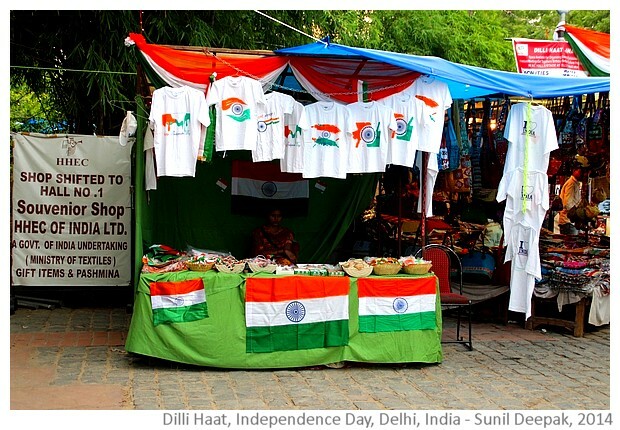 In the central park, everybody was busy getting clicked in front of the giant Indian flag. 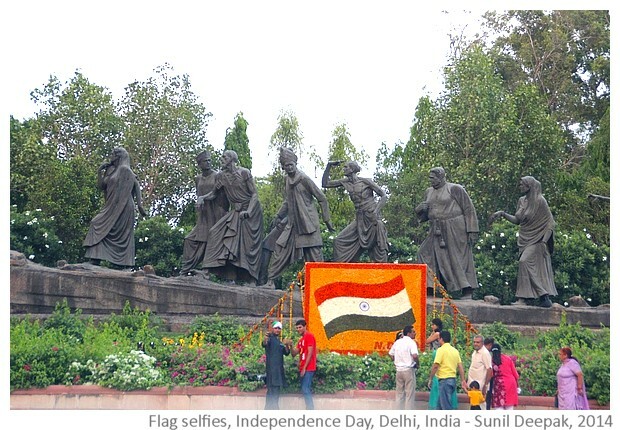 Along the way, people were busy taking their selfies in front of flower-flags set up by NDMC in different places. In India Gate, crowds were unbelievable. 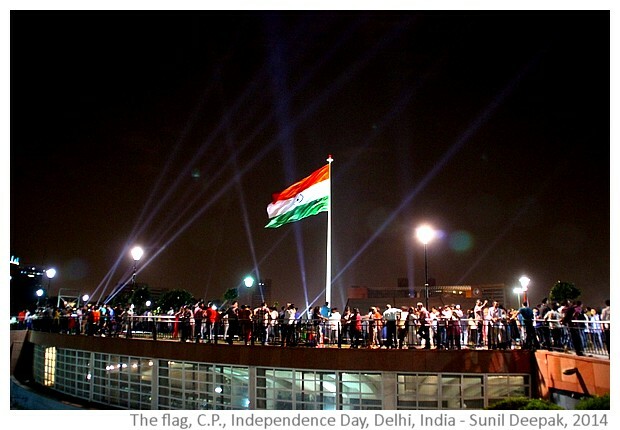 It was a wonderful way to conclude the Independence day, watching people express their joy in being Indian. Thanks Cifar for your appreciation. Happy independence day to you as well.